I have a party coming up and I want to make a comfort food soup. Something pretty easy that everyone would like. It is a all girl party so I was thinking something kinda light and healthy. Part of my plan came thru with the comfort, but the light and healthy went out the back door. Made this, loved it, so we are having it with Buffalo Chicken Strips. Figure if we are gonna get comfty lets go all the way. 1 1/2 c. dry elbow macaroni 6 oz. Cook macaroni in a pot of salted water according to package direction, drain and set aside. Stir In flour to coat and cook 1 minute. Deglaze with wine and simmer until nearly evaporated. Stir in broth, mustard, nutmeg and cayenne. Simmer until slightly thickened, 5 minutes, then whisk in milk and warm through. Do not let boil or base may become grainy. Add cheddar, 1 cup at a time, allowing it to melt completly before adding the next cup. Stir in macaroni, lemon juice, and salt, remove from heat. This is where I put the soup into a crock pot on warm for 2 hours because I was not ready to serve it. When ready to serve I had to thin down a little with some chicken broth. 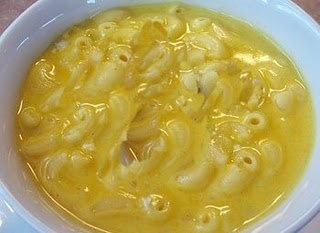 You could also use some milk or just left it thicker for a not so soupy Mac n Cheese side dish. There are a lot of choices for add in’s to this soup to make it your own with veggies or meats ( ham, bacon,pulled pork). Sprinkle with your favorite herbs (thyme,parsley,cilantro,chives).A few pickled jalopeno’s on top makes me happy. ♥ So I can make this ahead of time and stick in the crock pot. Buy some of those frozen Buffalo Chicken Strips and we will be set for dinner during our Bunco mania.